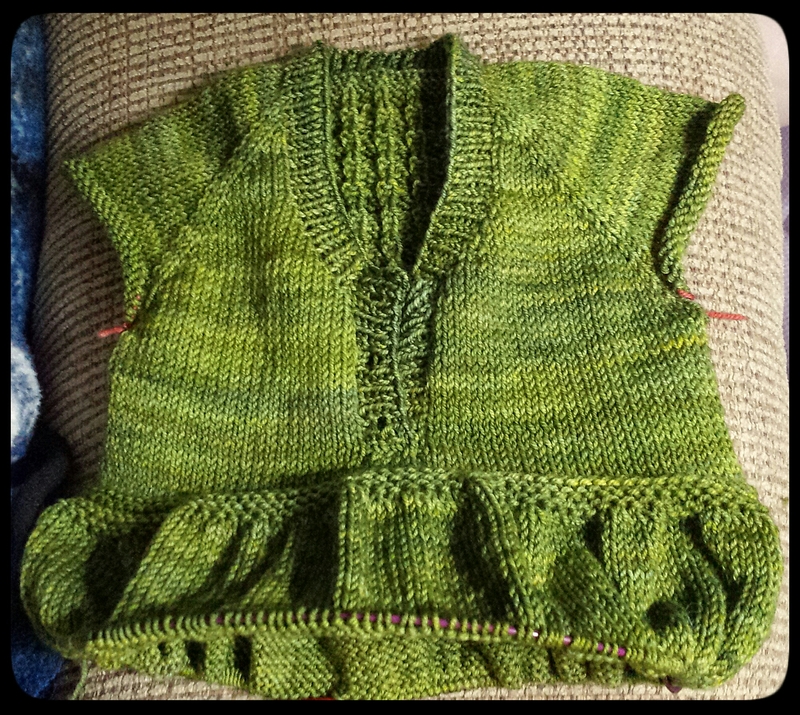 Ronan’s Christmas Vest – Complete! Three out of five Christmas outfit pieces are complete! 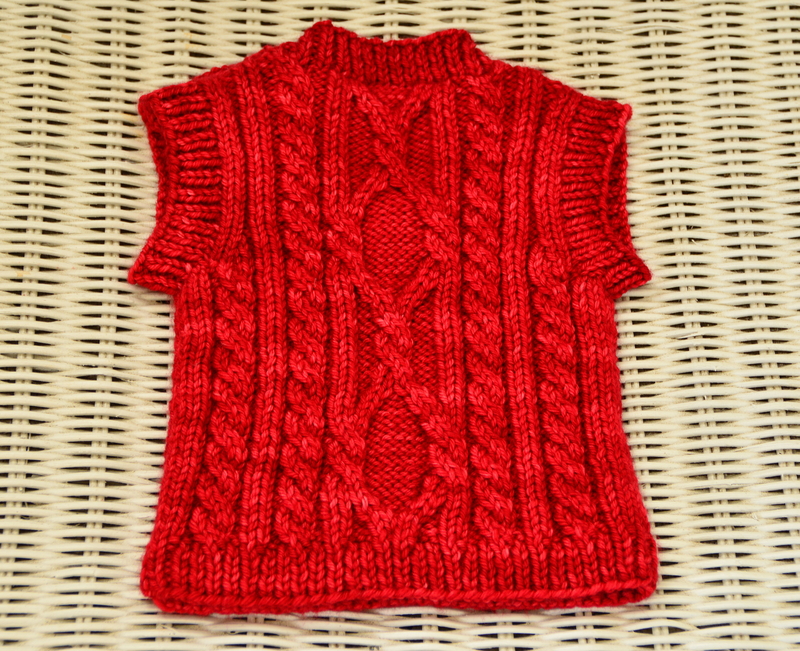 This adorable little vest was knit with size 4 and 5 needles and in Malabrigo Rios in “Ravelry Red.” I followed the instructions for the 6 month size (the smallest size available), but I used smaller needles so the vest would turn out a smaller size. Ronan will be less than 3 months old come Christmas time, and he’s not exactly a large baby. I chose to use two Scottie dog buttons to close the shoulder. I’ve had them in my button stash for many, many years. I’m so glad I was finally able to use them! 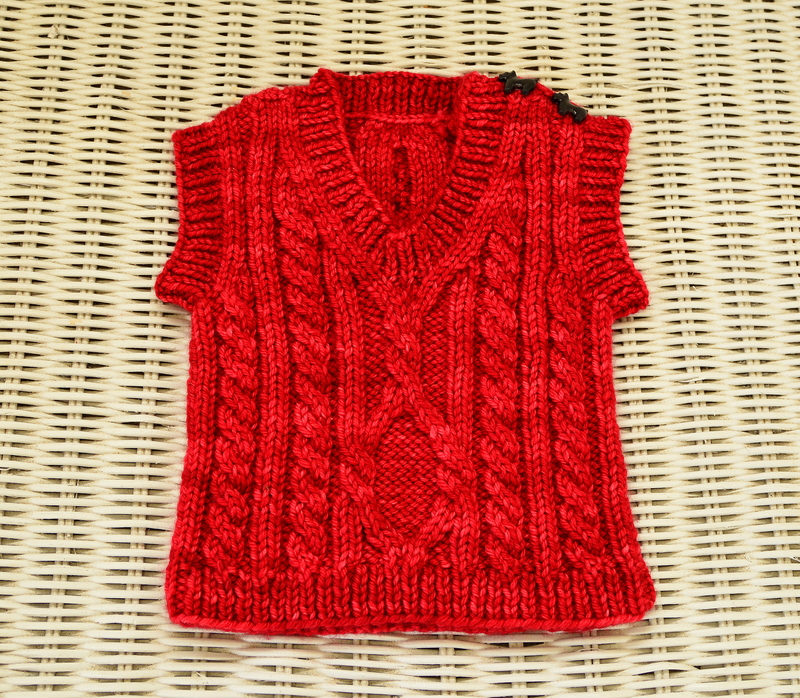 Categories: Knit | Tags: baby, cabled, christmas, knit, knitting, merino, red, vest | Permalink. 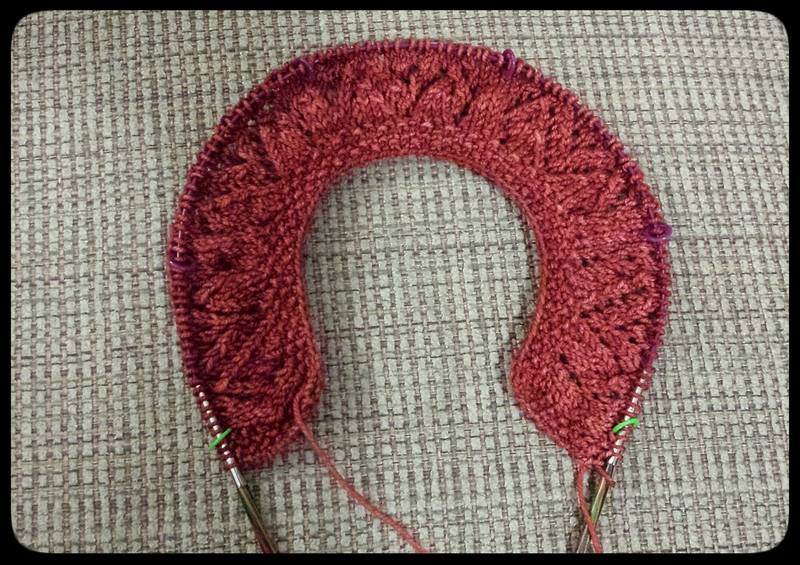 I’m using Malabrigo Sock in “Ivy” and size 6 needles. 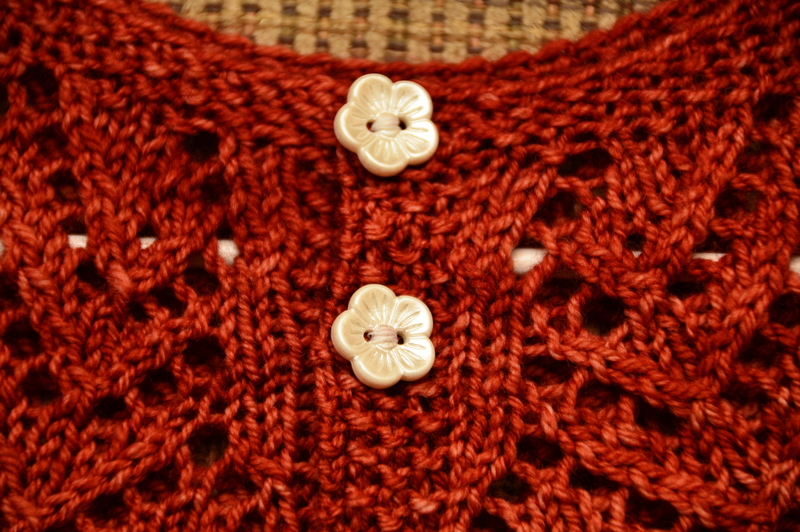 (The neck and button bands were done with size 4 needles.) 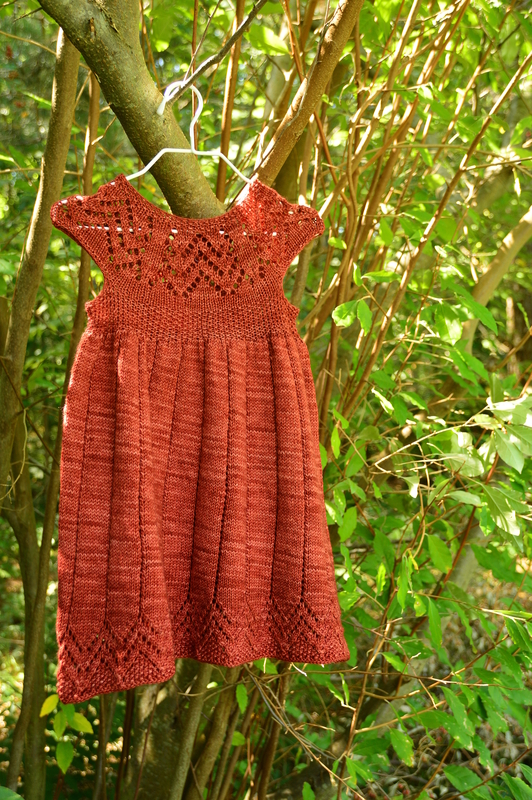 I hope I have some yarn left over once the dress is done to make Kirsi a hat like Eva’s. I love matchy-matchy! 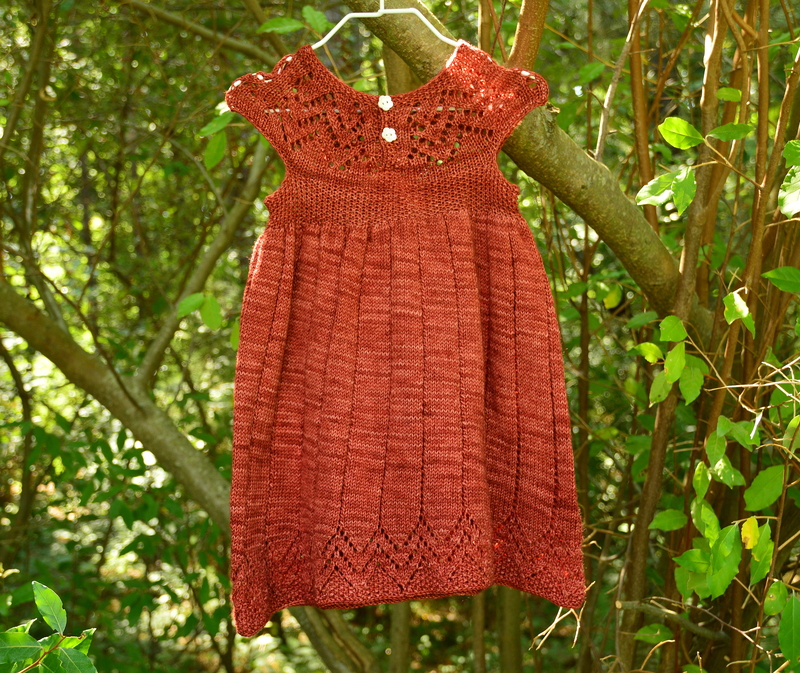 Categories: Knit | Tags: christmas, dress, green, handmade, knit, knitting, lace, merino, raglan, toddler | Permalink. 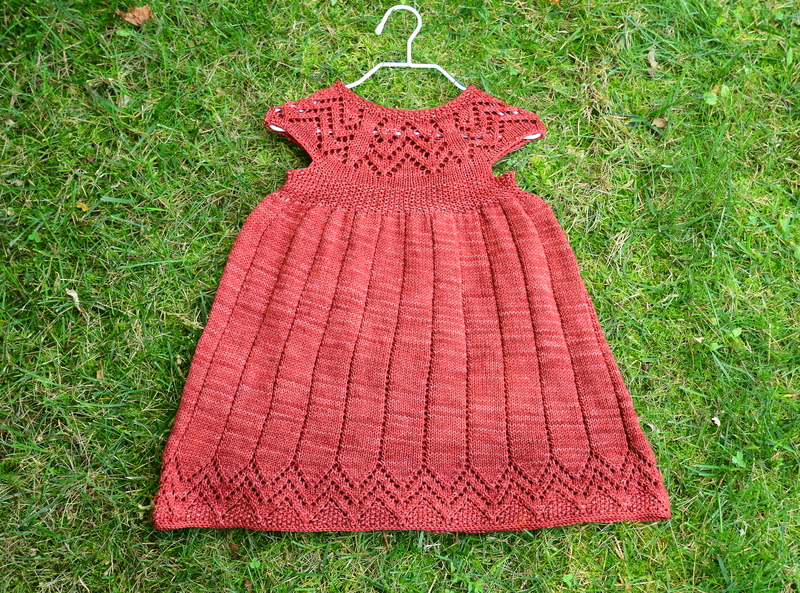 Kirsi’s Christmas Dress – Finished! The first of five Christmas outfit pieces is complete! I love it. It’s absolutely beautiful. I used about 1.2 hanks of Malabrigo Sock in “Boticelli” and size 6 needles. My gauge came in at 6.5 stitches x 8.5 rows = 1 inch. Still smaller than what the pattern called for, and I used needles two sizes bigger! The skirt measures 13 inches from the top of the seed stitch band to the bottom of the hem. The seed stitch band measures 19 inches around. I chose two white flower buttons for the back of the dress. I didn’t want to go with anything Christmas-y because I’d like her to be able to wear this dress for more than one occasion. 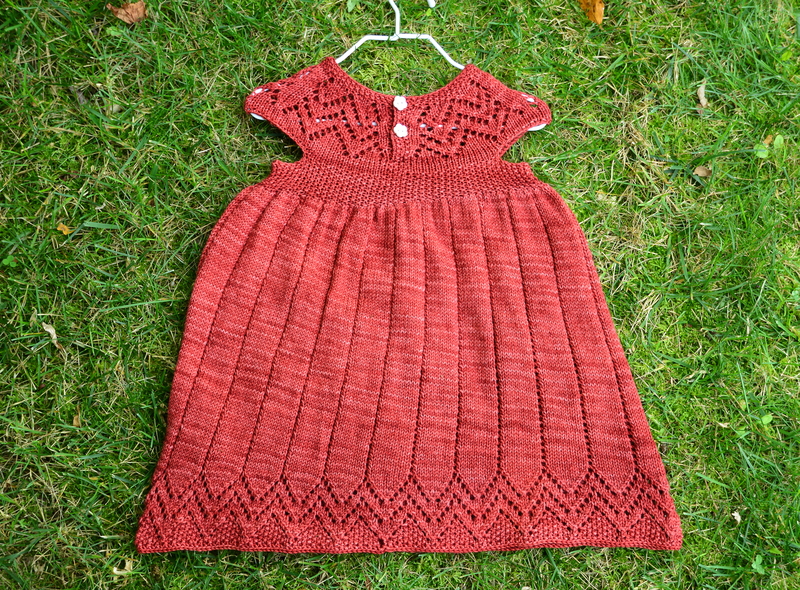 Categories: Knit | Tags: baby, christmas, dress, handmade, knit, knitting, lace, merino, red, toddler | Permalink. I’ve finished a couple of projects in my absence, but I haven’t photographed them yet. Hopefully I’ll be able to do that soon so I can share them! I do, however, have a WIP to share with you guys! 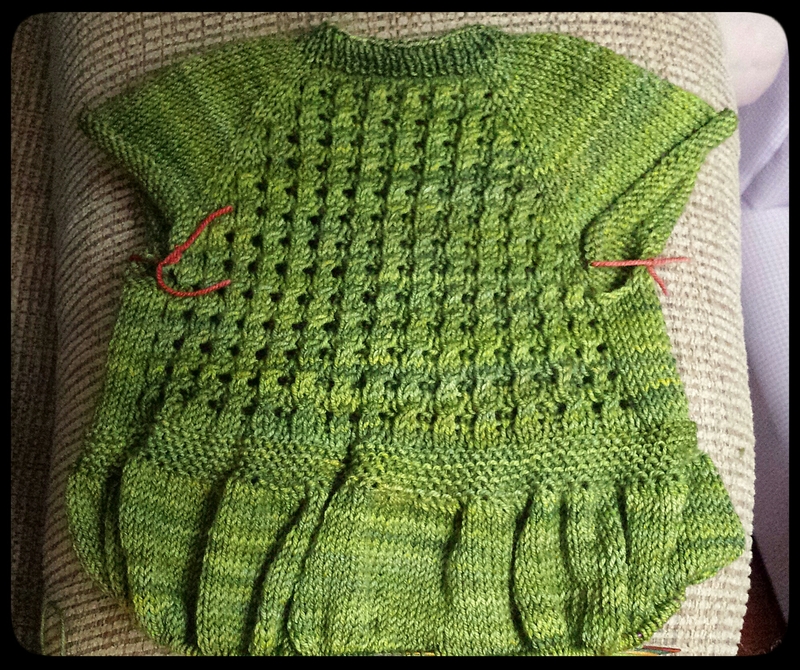 I’m still working on the part of the yoke that’s knit flat. I’m not sure how I feel about the pattern, yet. I’ll be able to make a better judgement once I’m further along. I’m knitting the 18 month size and went up two needle sizes to a size 6 to account for my tight gauge and rapidly growing toddler. I hope it fits when I’m finished! 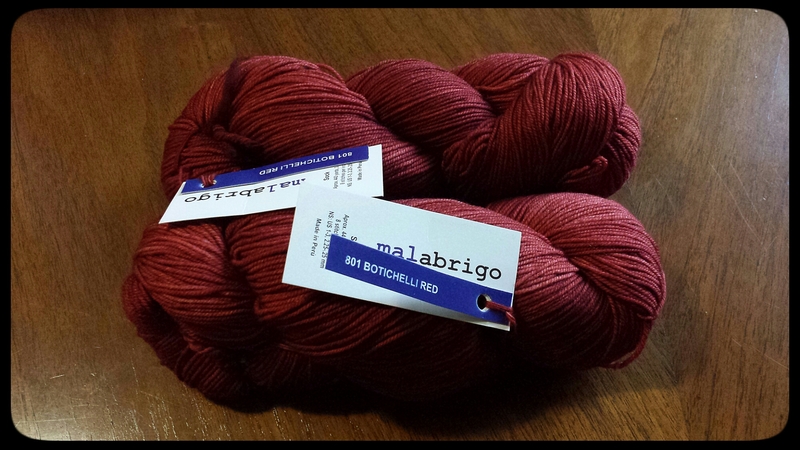 I’m using Malabrigo Sock in “Botichelli Red” or “Boticelli Red.” My tag says “Botichelli,” but Ravelry and various retailers are spelling it “Boticelli.” The yarn fought me during winding, but I prevailed. 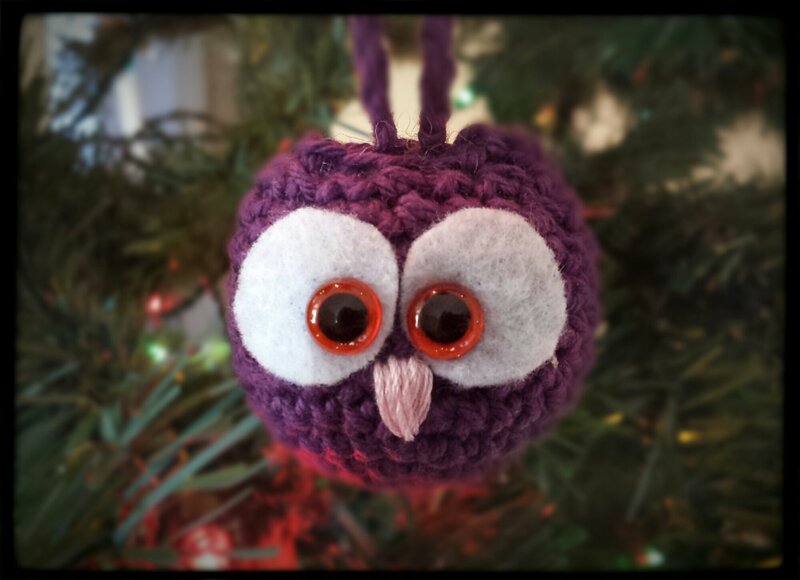 I used crochet thread to make the snowflakes and scraps of worsted weight yarn to make the owls. 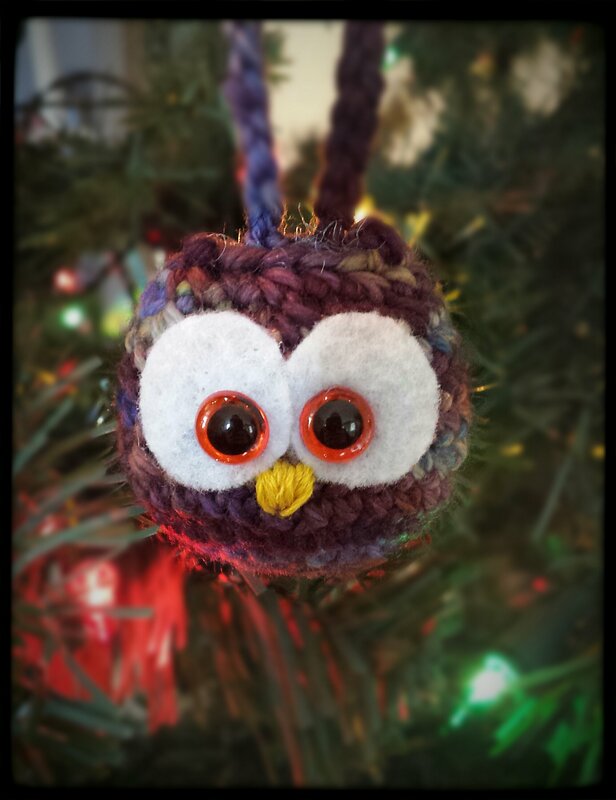 There was also some felt, safety eyes, and embroidery floss involved in constructing the owls. These owls are SO CUTE. I need more! The safety eyes really make a difference. Eva thinks they’re cute, too, and likes to change their position on the tree from time to time. I think I’m going to make a couple each year as a tradition. 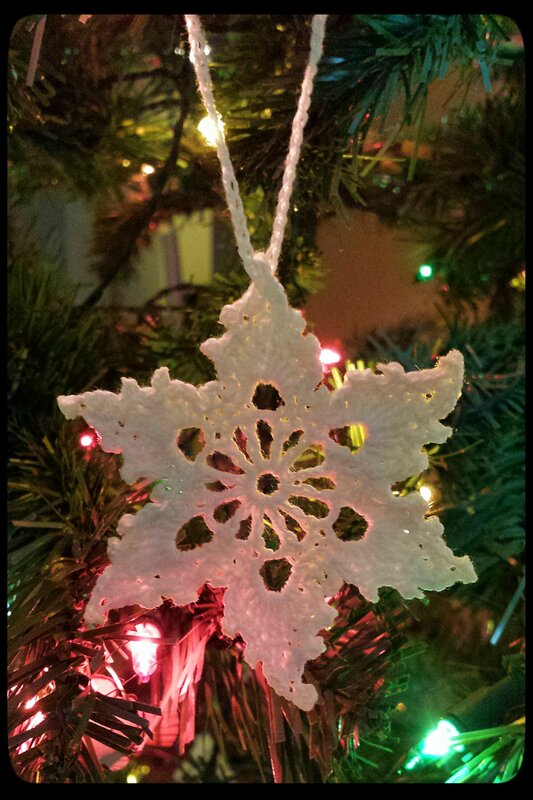 I haven’t got much to say about the snowflakes except that I’m horrible at pinning out and starching, apparently. My mom requested them for her tree, so that’s where they’re living now, along with one of the owls. I’ll probably make some for my tree, eventually, but I’ve got some more pressing projects to finish first. 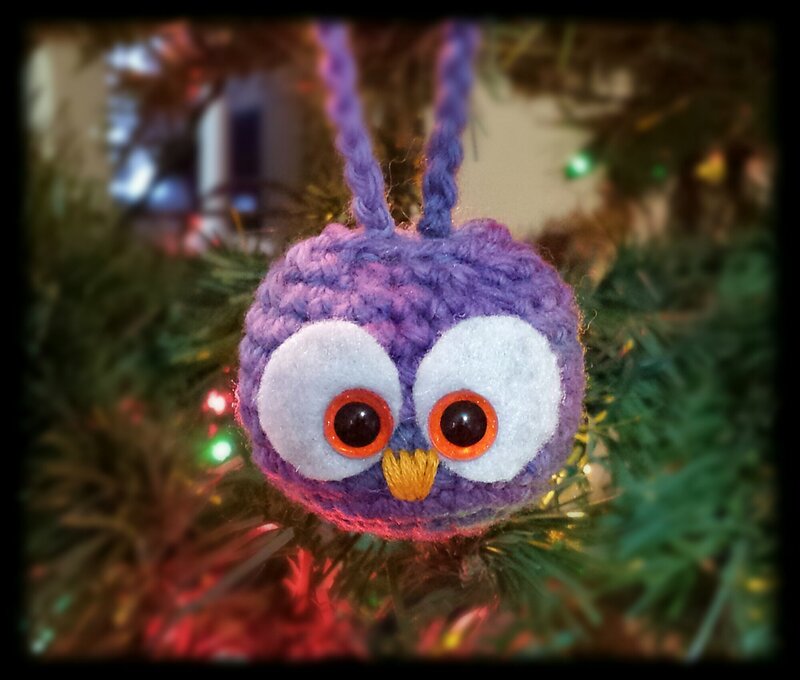 Categories: Crochet | Tags: christmas, crochet, handmade, ornaments, owl, snowflake | Permalink. 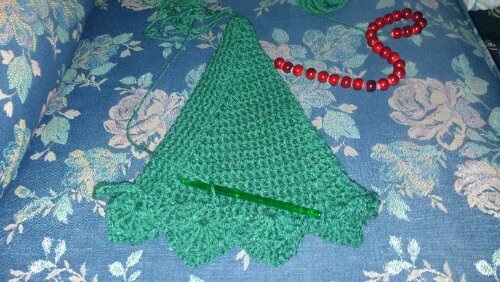 Since I needed a project to work on while my shrug was blocking, I started crocheting a Christmas tree for a friend of the family. 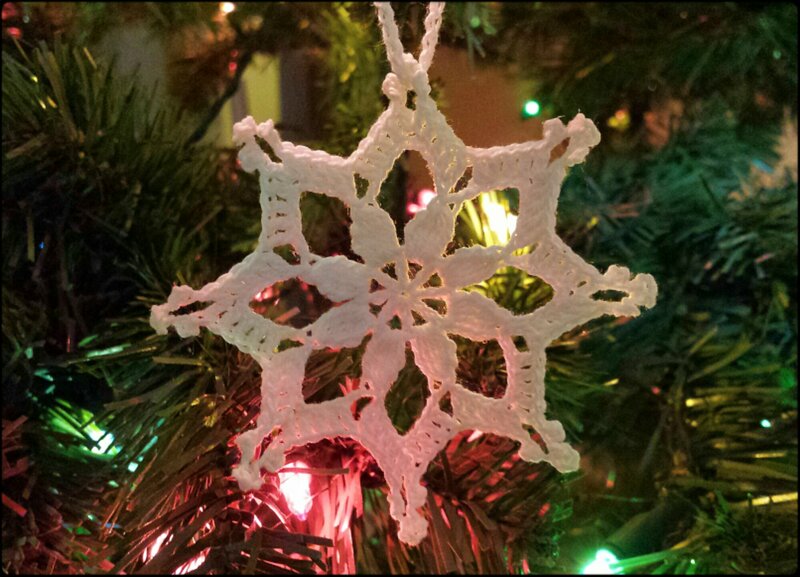 She sent over a crocheted Christmas tree that her grandmother had made years ago and asked me to make something similar. After a little bit of searching on Ravelry, I decided to try this pattern. I added 10 rounds to the cone following the established increase pattern to give the tree more height. The finished tree seen in this photo is what I'm attempting to recreate. 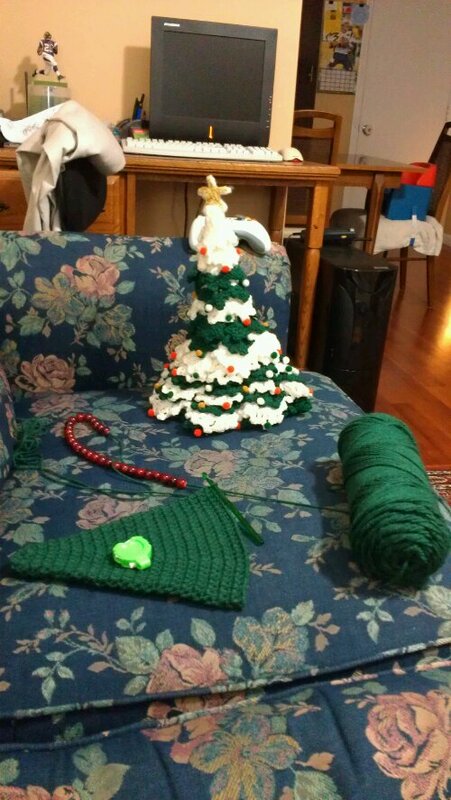 I was told I could take some creative liberties, so I’m using green yarn only, and I’m going to use beads for the ornaments instead of using hot glue to attach pom poms to the tree. I haven’t decided what I’ll do for a star, yet, but I’m pretty sure pipe cleaners will be involved. I’ve started adding some branches, and after a little ripping, I’ve determined how I’ll be adding the beads. (This is my first time using beads, so I needed to practice a little.) I will start using the beads after I’ve completed a few rounds of branches. I tried adding a bead to one of the braches in the second round, and it touched the ground. Not exactly what I was going for. I’m pretty confident that this tree will look awesome when it’s done. And if I’m successful, I’m totally making one for me. 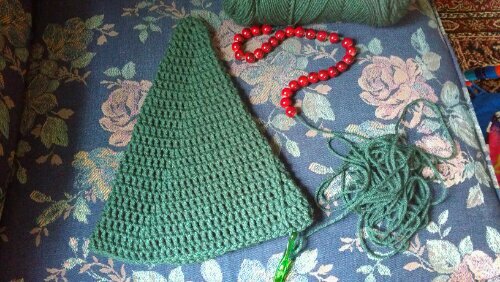 Categories: Crochet | Tags: acrylic, beads, christmas, crochet, green, tree | Permalink.